Whether it is for cutting wood to burn a fire in the middle of a cold campsite or to build a temporary shelter for a comfortable sleep at night, the best camping axe can be handy in more ways than one. It is one of the camping tools that should not be ignored because of its plethora of uses. 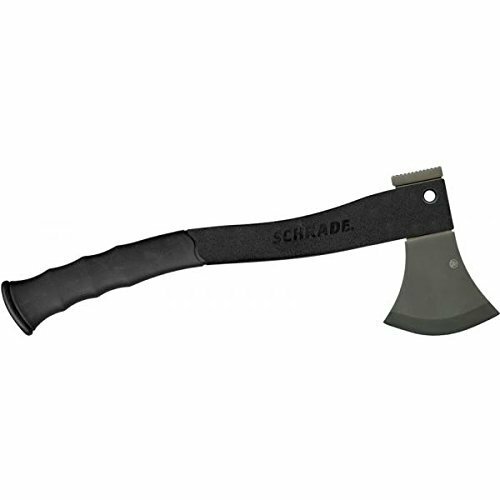 Axes are often associated with violence but not for serious campers. It is an indulgence that is sure to be worth the money. Finding the perfect axe to bring to the campsite, however, is not an easy process. You will be overwhelmed with the long list of the alternatives. With this, keep on reading and we’ll help you come up with the right decision. Undecided which product is the best to buy? Do not be left guessing. Below, we will list down five of the products that should be on your radar. This is made by one of the most trusted brands of outdoor products, making it one option that deserves a spot on your list. Even if it is made by Coleman, the price is pretty much affordable for many campers. Looking at its features and construction, one of the most impressive is the head, which is made of drop-forged carbon steel. This is hard to match when it comes to durability. However, there are some users who complained of how the bevel angle is quite off. The weird shape may sometimes make it difficult to use. With the sharp head of the axe’s edge, splitting wood will be almost effortless. On the other hand, you can use the flat edge to drive tent stakes on the ground to serve as a strong foundation. As for the handle, it is mostly made of forged steel and covered with rubber. It has an ergonomic design that makes it easy to hold. The rubber used is also great as it prevents the axe from slipping, which is one thing that makes it safe to use. This axe is made by a trusted outdoor brand and comes with a steel head, although the bevel angle seems a bit weird. It comes with an ergonomic handle with a non-slip cover for your comfort and safety. One of the first things that you will notice in this camping axe is the all steel construction. This is a plus when it comes to durability, providing an assurance that it will last through the years. Nonetheless, the weight can be a drawback. A lot of people will find it to be a bit heavy, which can make its use quite uncomfortable. More so, it comes with a 26-inch handle, which some users may find it to be quite longer compared to what they are used to. The lower part of the handle is wrapped with genuine leather, providing users with an excellent grip. This minimizes the likelihood that it will slip off your hand, which is important for your safety. As a bonus, the axe comes packaged with a sheath. This is made of ballistic nylon, which will cover the head of the axe to get rid of external factors that could possibly speed up its wear. Lastly, it should also be noted that it has been hand-polished. This shows how attention is poured into every detail, making its performance hard to match. This hand-polished axe has a length of 26 inches and comes with all stainless-steel construction. The handle is wrapped with genuine leather to make it comfortable and a ballistic nylon sheath is included to maintain its sharpness. One thing that makes it stand out from most of its competitors is its ability to deliver excellent value for the money. 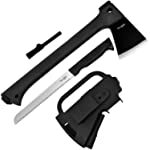 The latter can be attributed to the fact that aside from the axe and its molded plastic case, it also comes with a small saw and a fire starter. True enough, it can be your ultimate camping companion. The 420 stainless steel blade has also been given words of praises, although there are some people who noted that this may not stay sharp for a long time. All that you need is to have it re-sharpened to restore its functionality. The plastic-wrapped handle is also a plus. This is unlike other cheap ones that can easily peel or flake. It is also not slippery, which will be vital in terms of your safety. With this product, you will get not only a camping axe, but also a molded plastic case, fire starter, and a saw, which will all be useful when you are in the campsite. The axe comes with a steel head and a non-slip handle with plastic wrapping. 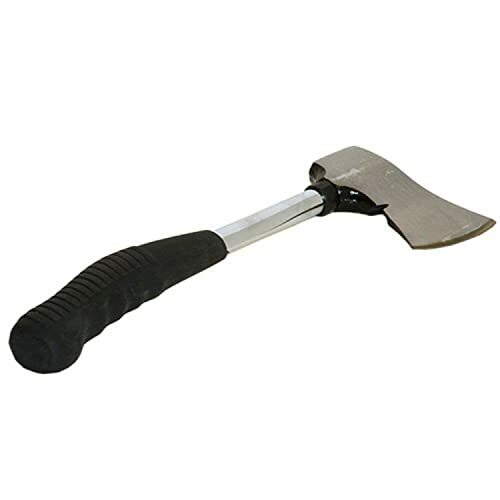 The durability of this camping axe is one of the reasons why this is a top-rated product. This can be attributed to the quality of the materials used in its construction. From the head to the handle, you can be sure that it will be able to withstand the test of time. For your safety, you will love the non-slip design, which is because of the rubber grip that is integrated into the lower end of the axe. If there is one problem, however, it would be that the coating might easily peel, especially for users who have sweaty hands. Lastly, there is also a polyester belt sheath that makes it easy to carry the axe on the way to the campsite while also protecting it from the external elements when it is stored. 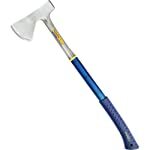 This camping axe is known for having a blade that stays sharp for an extended period, as well as a convenient grip, although the coating of the latter can peel quite easily. One of the best things about this camping axe is how you can use it immediately right out of the box. This is unlike many others that will need to be sharpened before the first use. Also, you will love how it will take quite some time before the need to have it re-sharpened. The black rubberized handle is also a good thing. Although, based on the experiences of other people, the handle can easily separate from the blade, which is a frustrating situation to experience. It is also excellent in terms of portability. It has a short handle and a sleek design, which will allow you to carry it with ease. However, because of its size, there is a tendency that it will easily fall of the holster, so you have to be sure that it is secure in its position as you walk. 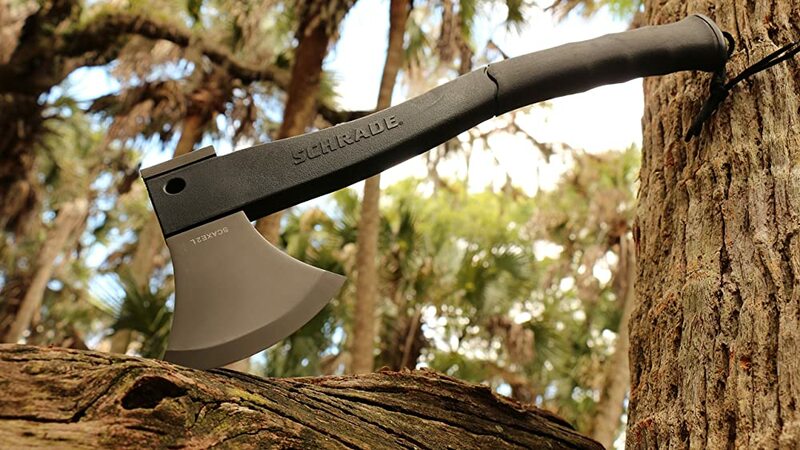 This lightweight and compact camping axe is the perfect companion for your outdoor expeditions. It has a stainless steel blade and a rubber handle that is comfortable to hold, even when you are using it for an extended period. Still not convinced that a camping axe is a must-have? The list below might just instantly make you change your mind! Build a Fire: Whether it is for cooking or to just keep you warm in the campsite, an axe is needed for splitting wood, which will be necessary for starting a fire. Create a Temporary Shelter: When you do not have a place to live in the wild, an axe will come handy to build a temporary house. You can even use it as a hammer for the stakes of your tent. Clear the Campsite: Often, you will be greeted with a messy campsite, which can be unsafe and uncomfortable. You can use the camping axe to get rid of the distractions around the area, such as branches of trees that could get in the way. However, remember to not cut trees in the campsite. Weight: A lot of people prefer one that is lightweight, which means that it won’t be a burden to have it carried to the campsite. However, in some cases, if it is too lightweight, balance can be lost when it is used, which can compromise safety. Materials: There are two important parts that should be made using premium materials – the head and the handle. The head is often made of stainless steel. It should stay sharp through the years. The handle, on the other hand, is wrapped with nylon, rubber, or plastic. It should be non-slip and should have an ergonomic design for your comfort. Safety: Take note of the features that will make it safe. For instance, a one-piece construction is great because it lessens the chances that the head will separate from the handle upon applying a strong force. Sheath: As a bonus, you should look for a camping axe that already comes with a sheath or cover. This will not only prevent accidents but will also be great in terms of keeping the blade sharp and protected from dirt or dust. Be sure to clean the axe right after every use. Warm water and mild soap will be enough. Remove the dirt on the surface, especially if it is mud. It will be harder to take it off once it has hardened. When the axe is not being used, keep it in a safe place away from direct heat and moisture. Use the sheath or the cover that is included to minimize wear. Sharpen the blade as needed. When the performance starts to suffer, this is an indication that the blade is already dull. Some manufacturers will even provide a sharpening disc for free. If you see any rust that is starting to form, especially on the head, remove it as soon as possible. You can do this with the use of a steel wool. The failure to remove the rust immediately can make it spread. Inspect the handle from time to time, making sure that there are no cracks, dents, or any indication that it will become weaker overtime. Oiling the head of the axe is also recommended. You can use a gun oil for this task. This will make the axe last longer. Take note that the moisture is one of the mortal enemies of the axe. The prolonged exposure to moist can speed up the appearance of rust. Stay away from moist to prolong the lifespan of your camping axe. The next time you head to the campsite, see to it that you have an axe with you, including the five options that have been briefly mentioned above. They may be quite a heavy addition to your gears, but the added weight will definitely be worth it as it has endless uses!